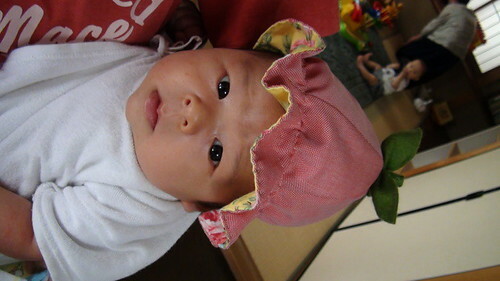 I saw a cute strawberry hat at a baby wear shop but it was too expensive for me. So I made it! I used a free pattern of turip hat and put leaves on the top. So I made the second one with a little bigger pattern. Then I made the last one. Finally it fits Miyu very well! Miyu cannot wear the first two, so I gave them to my friends (* v *)!!!! The smallest one is to a newborn boy. The midium one is to one of her boy friend. 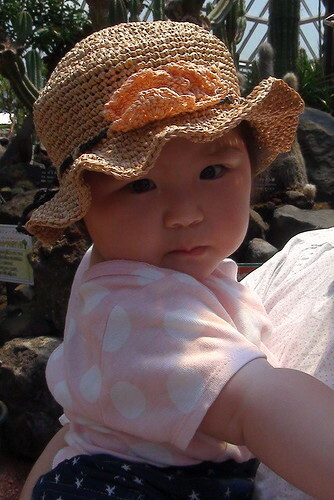 Miyu has another cute hat that my mother knitted. It fits her very well. I also made a bow hair clip. I enjoy sewing small things for her while she is sleeping. It relaxes me a lot. Miyu is 9 months old now but she doesn't move so much... So many her friends come to her, hug and kiss her (* v *)!!!! 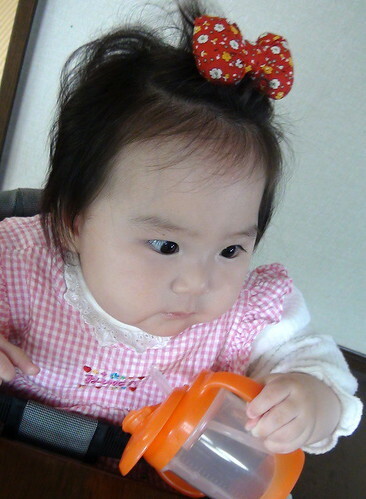 Miyu is 8 months old now and several days before she rolled over for the first time. Maybe it's because she is too big, more than 10 kg already. We stay at a big house usually. Lots of elder people and babies come and enjoy together. A day I taught an italian recipe which I learned when I stayed in Italy. We enjoyed the lunch very much. 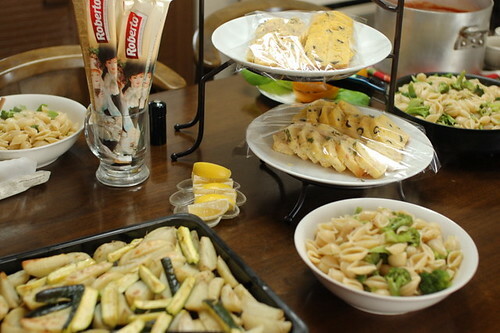 When I stay at home the lunch time is very busy, but when I stay here, I can take my time. Because someone helps me holding Miyu. 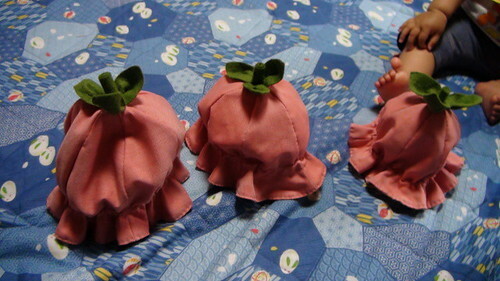 These days I'm teaching hand sewing for my friends. 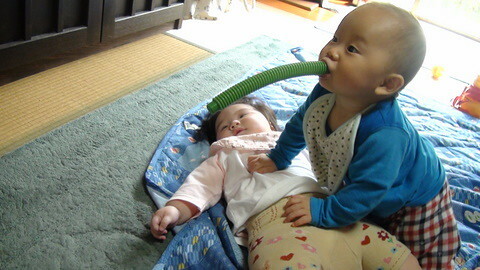 They enjoy making clothes for their babies. and this skirt. The pants is with SWANY's pattern and the skirt is with Japanese free pattern. We are happy with our lots of friends. When I think of the earthquake and the people of the area, I always feel I'm too lucky. 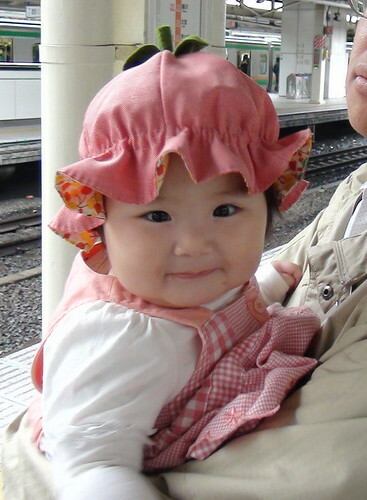 I should do something continually, what I can do with Miyu. I planned a short trip at this weekend with our both parents. 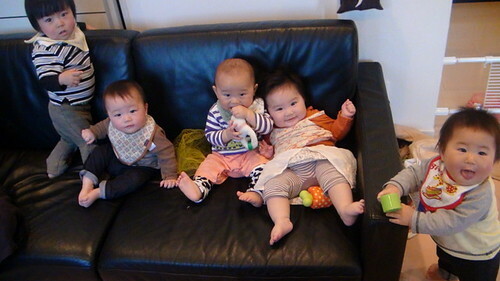 They live very far from us, so they cannot meet Miyu so often. So they are looking forward to meet her.